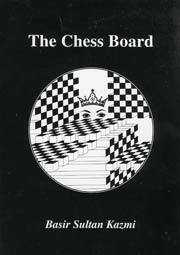 The Chess Board, a play in four acts, was originally published in Pakistan (1987) and was widely appreciated. Set in olden times, the princess will only marry someone who can beat her at chess. Son of a famous Urdu poet, the late Nasir Kazmi, Basir Kazmi has now translated The Chess Board into English. "The chess match should be seen as emblematic of the eternal struggle we have with ourselves and between men and women. The beauty and, I believe, the success of Basir Kazmi's play is that both the main characters see the futility of this struggle but this does not guarantee their happiness." Basir Kazmi has recited his poetry all over Pakistan, Britain and Norway. In 1992, he received the prestigious Writer-in-Residence Award from the North-West Playwrights' Workshops. His plays have been staged at well-known theatres in Greater Manchester and Liverpool, including the Green Room, Contact Theatre, Coliseum, Octagon and the Unity Theatre.